A good day of skiing – like, those really good days when the snow is fresh and deep and makes your legs hurt – is hardly complete without the legendary times to be had when the lifts shut and the taps open. There’s always a debate as to which nation produces the best drinkers, but it could be argued that when it comes to communities, no one drinks better than skiers and snowboarders. Hell, some people will go and do a couple of laps on the West Coast Crud we’ve been having this season, just to hit the aprés scene. And for the longest time, Kokanee has touted itself as “The Beer Out Here”. Brewed in Creston deep in the Kootenay Mountain range, and intertwined with mountain resorts all over the West, its signature Sasquatch is seen swinging from rafters, giving out free beer, and generally trying to stop you from ogling too hard at the Kokanee Girls. If you look really closely, you’ll see there’s actually a case of beer in this photo. But we’re not here to talk about mythical alcoholic beasts and girls in silver skinsuits. The Glacier Fresh team are launching a new brand. 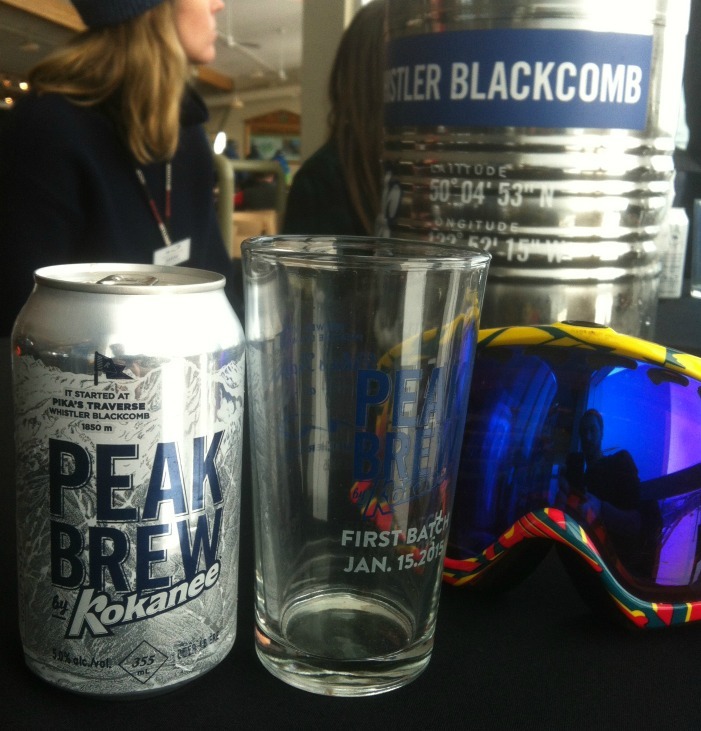 Named “Peak Brew”, Kokanee has collected pristine alpine snow from 7 of the biggest ski resorts in Western Canada. They have then used this in the brewing process, giving us – for some, literally – a taste of home. But these aren’t men in white suits and garbage bags collecting all that snow. They figured they may as well get some high-octane friends to match this high-octane mission. ML buddy Rory Bushfield stepped up to collect from his local mountain, up at Pika’s Traverse on Whistler Mountain. 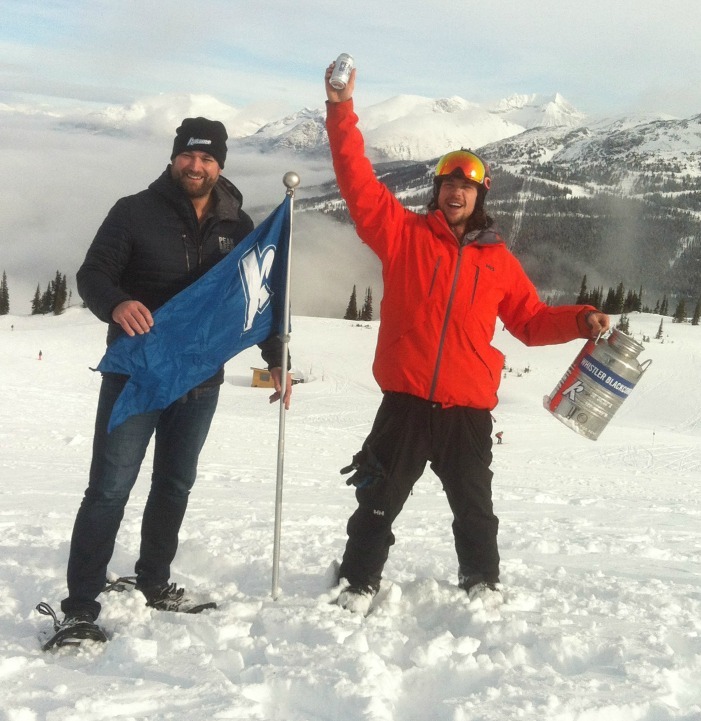 “I love to ski, and I love to jump out of airplanes,” Bushfield summed up on Whistler Mountain at the official Peak Brew launch last week “To do it for Whistler in the name of a beer …it was a no brainer.” Keep an eye out for his promo video, one of 4, which hits Youtube Monday, Feb. 16th. It’ll tie in with the date Peak Brew is available in select bars and restaurants.